‘Sewindu’ is the first retrospective of Laila Azra’s works that unites a selection of paintings and installations demonstrating her artistic development from 2010–2018. The Singapore-based abstract painter, Laila Azra (b. 1970, Jakarta, Indonesia) uses a technique of building up layers of acrylic paint, liquid latex and resin to achieve diversity, depth and volume to resonate multifaceted layers of place, space and time. Her works materialise a visual narrative of celebrating achievements and successes after hustling through a long and winding path of life. This exhibition will include Azra’s ‘Cinta Merah’ (Red Love) from the series, ‘Red, Yellow, Black’ (2017), an exploration of primary colours in art. She created an attribution to human’s lifelong quest to find love in God as well as life partner. The circular shape of the canvas and the spiral stroke throughout the work illustrate the never-ending journey—once you find love, you have to maintain it, which is harder than finding love itself. One of the 2 installations on display is ‘Material Garden’ (2012)—an attempt to define money and question our pursuit of it. 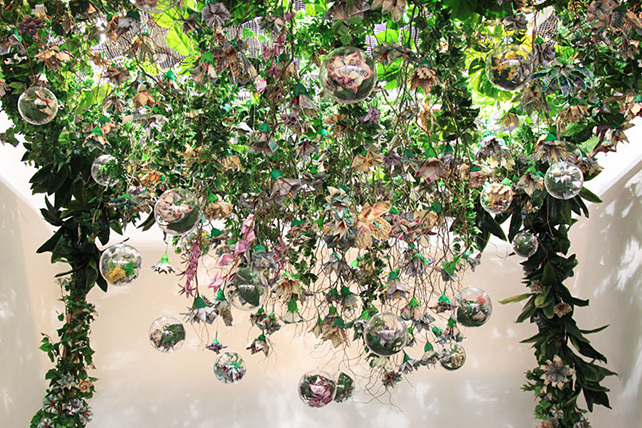 The origami-like flowers and plants were made from folded Indonesian banknotes dominating the room, contrasting nature’s beauty against the power and influence that money can provide. The second installation is ‘Reminiscence’ (2013)—a Rumah Gedek (Bamboo House) to revisit her roots and identity after spending most of her life in Bogor, West Java, before moving to Singapore in 2004. “Our understanding of what we see is conditioned by our personal and social-cultural experience, and the Gedek immortalised a distant but treasured memory—a life memento,” she says. This ‘Sewindu’ (8 Years in Indonesian language) exhibition will focus on the visual progression of Azra’s methodology and personal narrative. Her composition is influenced by personal experience at a universal level that is easily relatable to the audience. She imbues paint and various mediums with emotional resonance yet at the same time restricts those emotions within the confines of her often indefinable and mysterious forms, dabbing from threads, fabrics, screen printing to 3D pen drawing to name a few. She adapts gestural painting method and uses her hands and body movement to drip, splash, and scrape on a canvas that is often positioned flat on the floor. This results in bold, rhythmic lines and texture-rich artworks, which are characterised by the weaving and interweaving layers of acrylic paint as well as her other chosen mediums. Over the years and through series of discoveries, it is evident that Azra has grown more confident in her practice by working around the optical qualities of the canvases and breaking through two-dimensional boundaries to push paintings into the three-dimensional. Azra is a keen observer of her environment, issues surrounding culture and community. In her latest works, ‘Salient’ (2018) and ‘Blue Nuance’ (2018) unite various media of acrylic paint, latex, hand stitching on textile (such as velvet and linen canvas). They represent complex issues of society and identity, and she believes that with open-mindedness and forged alliances, these differences will thrive and cohere. Azra always strives to preserve the essence of abstract art and create dynamic viewing experiences. Graduated from Nanyang Academy of Fine Arts (NAFA) in Western Abstract Painting, the influences of Abstract Expressionism techniques made popular in the 1940s by the likes of Jason Pollock, Willem De Kooning and Mark Rothko, resonate in Azra’s art making. She has participated in many local and international exhibitions including Indonesia, France, Malaysia, and Germany.